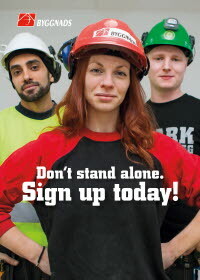 Byggnads is the trade union for all construction workers in Sweden. Approximately 80% of the people working on building sites in Sweden are members of Byggnads. In major cities and towns, and on major building sites it is common to have a level of affiliation of 100%. Byggnads is an organisation which is paid for by the members themselves. The more members a union has, the greater its power at the negotiating table. That is why it is so important that everyone is on board. How do I get in touch with Byggnads? How do I become a member? There is a union representative, or elected representative, at many workplaces, and this is the person you should turn to first. He or she can help you to register as a member. Otherwise you should contact the nearest local Byggnads region. Or you can always contact the Byggnads membership service on the following telephone number: 010-601 10 00. There is no minimum wage legislation that determines pay in Sweden. Instead we have a joint agreement between employers and workers, which we call a collective agreement. The workers are represented by a trade union, in this case Byggnads. The employers are represented by an employers' organisation. Your pay is negotiated by experienced officers from Byggnads. The Byggnads collective agreements are set agreements between Byggnads and the employers. Byggnads and the employers together negotiate the collective agreements that apply to everyone. They are usually renegotiated roughly every other year. The agreements provide for pay, working time, holidays, insurance and other employment conditions. If the negotiations break down, this often leads to industrial conflict. However, this rarely happens in practice. All parties gain from maintaining peace on the labour market. Usually they come to an agreement. Sweden has the lowest number of days of industrial conflict in the whole of Europe. You can get advice; we help you to explain what your rights are and what is provided in the agreements. You can get help regarding working conditions such as lack of protection or the existence of hazardous construction materials like asbestos at the workplace. In such cases you should contact the Byggnads safety representative or elected representative at your workplace. There should be a sign at your workplace telling you who your safety representative is. Competent and experienced trade union officials negotiate your pay for you. You get an insurance policy through the collective agreement that applies for illness, injury and fatality. You get a member insurance policy which includes different insurance areas e.g. group insurance, life insurance, insurance for accidents in your free time and child group life insurance. You can sign good additional policies, e.g. home insurance, child insurance and life partner insurance. There is also an income insurance policy which means that you receive 80% of your wages for a period of up to 200 days if you are a member of the unemployment insurance fund – the ”a-kassa”. The collective agreement also constitutes a promise between wage earners that they will not sell their trade at a lower price than what has been agreed. This would lead to what is generally termed wage dumping. It is not only your own wages that decrease, the wages of the entire collective professional group decrease too. Most employers respect the collective agreement and follow the rules and the legislation. However, an increasing number of workers get exploited under bad working conditions and poor wages by employers who do not want to follow the rules. This is not acceptable. Foreign workers have the same right to decent pay and working conditions as the Swedish workers. Do not let yourself be exploited. Get in touch with Byggnads if you experience something of this kind. Can I lose my job if I speak to the union? You have the right to remain anonymous when you speak to a union representative. The employer does not have the right to dismiss you from your job if you speak to a union representative or become a member of a union. You can get access to an interpreter who can explain what you do not understand in your own language. You have the right to working clothes, protective shoes and protective clothing. At the workplace you must have access to staff areas where you can wash. Swedish rules regarding the working environment must be followed. You do absolutely not clear a building/area of asbestos or other hazardous materials without protective equipment and training. You have the right to good accommodation. You should definitely not have to live at the workplace. Nor should you be forced to live in a caravan unless you have agreed to it. You should receive extra pay if your employer does not provide you with reasonable accommodation and you have to get hold of accommodation yourself. Your wages must be paid at least once a month on a fixed day. You must receive a payment slip every time which states how much you have worked and how much you have earned. In certain cases you shall also receive holiday pay and per diems. It shall be made clear whether any deductions have been made for food and accommodation, and how much tax has been deducted from your wages. If your wages are not paid out on the agreed date you must inform your employer. If you still do not receive your wages, then you must contact a trade union official at the local Byggnads section immediately. If you are sick you must notify your employer. Everyone who lives and works in Sweden has the right to healthcare. If you get sick, your employer shall pay sickness pay in accordance with Swedish legislation. In conclusion, what else do I need to think about? If you have got a job, you should be given an employment contract. This is a written contract from your employer stating that you are employed and including information about your pay. You must have a residence permit from the Swedish Migration Board where this is required. You must have good accommodation. You do not accept poor wages and working conditions.